Be the first to hear about the latest playhouse designs! Learn about Lilliput Play Homes' sales, specials, and promotions! Sign Up Today to receive Lilliput Play Homes' Monthly E-Newsletter! Just a quick blog post to let you know we are now on Twitter and Facebook. Please follow us on Twitter and fan us on Facebook by clicking the URLs below. I had to share this with you! On Friday, I was working hard (always!) when someone in the office shouted that the DJ's on a local radio station were talking about us. As everyone adjusted their radio dial, I visited the station's website and found this amazing article! So what do you think? Pool or Playhouse? And which playhouse would you choose? Personally, I think I would have to go with the Cotton Candy Manor...something about being able to go out on the balcony that I cannot resist!! My personal sign that the economy is truly rebounding: I have multiple large commercial play villages in varying stages of planning, submitting proposals, supplying samples, and actual construction. And these fantastic play villages will be located not just in the US, but around the world. (It is always an honor to work with my international clients!) When businesses are willing to invest in the future, the future is again bright. Besides just being a harbinger of hope for the economy though, it is also a prime example of how children play and learn around the world. Social interaction, role playing, and developing creative and imaginative muscles are vital foundation blocks in the development of a healthy child. *helps them develop a positive attitude towards life? *teaches your child to accept other's ideas, even when they are different from their own? *shows your child the cause-and-effect relationship between their behavior and the feelings of others? *helps them resolve conflicts in a more positive manner? *allows your child to act as part of a team? *offers your child opportunities to learn from mistakes in a positive way? Playing dress-up and pretending to fight a blazing fire - or playing "beauty parlor" and talking about hair styles - might sound like child's play, but in reality, it's child's work...and this, for once, is something they cannot get enough of! It was our pleasure to create an amazing playhouse for a wonderful family in Southern California. The house is a replica of their full-sized home and was designed for the entire family. 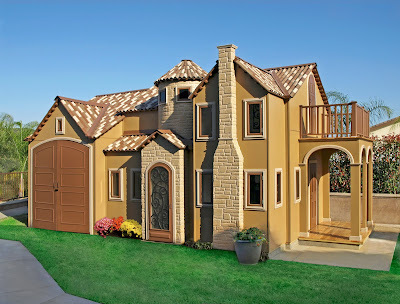 The children can enjoy a fun-filled playhouse complete with a Great Room, sleeping loft and art center. An elevated walkway runs the entire length of the Great Room connecting an exterior balcony with the interior sleeping loft. Mom appreciates the fine detailing that includes a faux fireplace and walnut mantle as well as simulated decorative wrought iron railings and hardwood floors. Wall sconces and interior pillars also add interesting accents throughout the playhouse. And we didn't forget dad! He enjoys the 7' x 15' attached storage shed to hide all his tools & toys. This was a project where the vision, trust and confidence that the customer entrusted in us allowed us to create a one of a kind family heirloom. Why wasn't this around when my kids were little?! HealthyChildren.org, the official American Academy of Pediatrics website for parents, features a new online tool to help gauge your child's symptoms. No more guessing when a fever spikes or rash appears. No more middle-of-the-night worrying. KidsDoc Symptom Checker allows parents and other caregivers to enter their child's symptoms into the interactive tool and receive up-to-date advice on how to treat minor illnesses at home - or when to call the doctor immediately. Based on 15 years of clinical protocols and over 150 million phone calls across the US and Canada, each symptom care guide includes a decision chart to help you determine the severity of the illness and how to manage it. Easy-to-navigate tabs offer Definitions, When To Call, Care Advice, and Photos (diagrams to help take away any guesswork). 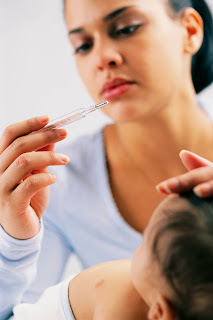 "Many parents have trouble deciding whether or not to call the pediatrician when their child is sick. 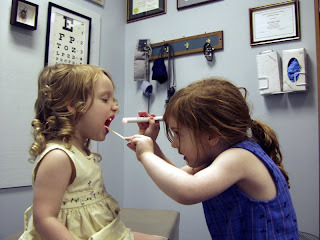 This new tool will help guide them to the right decision quickly and easily," says Jennifer Shu, MD FAAP, Medical Editor, HealthyChildren.org. The online tool is also available as a downloadable iPhone application called KidsDoc, providing the same expert advice for on-the-go parents. As any parent knows, children can get sick or hurt anytime, anywhere. Now, finally, there is a handy resource to help you make a smart decision on what (if any) treatment is needed.